After a successful run on the Nintendo Wii, Gaijin Games look to try their luck on the Nintendo 3DS in BIT.TRIP SAGA, a collection of all the BIT.TRIP titles released for Wii Ware. Of course with the 3DS, each title was given the use of 3D to enhance it however does BIT.TRIP do well? Or is it time for the retro to be put to rest? As mentioned before, BIT.TRIP SAGA is a collection of six downloadable Wii Ware titles including BIT.TRIP Beat, Core, Void, Runner, Fate and Flux with each easily accessible from the game’s starting menu. Each game generally goes with a rhythm and in a way, challenges the player by constantly having them to adapt to a new flow. 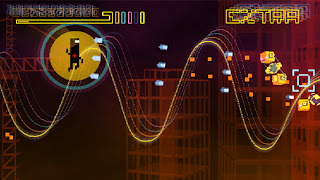 One particular game that uses rhythm really well is Runner. In Runner you basically have to try and get your character from point A to B while avoiding obstacles and collecting gold and power ups. 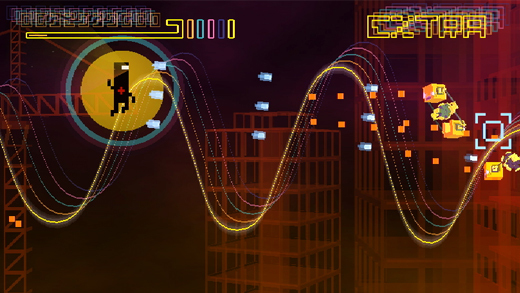 Every jump, slide or kick contributes to the beat as you try and sync yourself with it in order to complete the level. Fate will definitely prove a challenge! I should also mention that each title is not played the exact same way as some utilize the bottom screen, one requires only the Stylus and the other is played using the D-pad. For starters it’s a great choice in terms of controls however if you wanted to assign commands to different buttons, sadly there is no option available for that but the point of not having to use every button on the Nintendo 3DS makes this easy for casual players to pick up and play. One thing in common that all the titles have is that, the gameplay is basic but becomes harder as you go along. It’s good to see that each BIT.TRIP title does something different and offers something unique to help it stand out on its own. As the name implies, BIT.TRIP goes for the real, old school retro look in all of its titles, some making use of it more than others. All games apart from Runner utilize a sort of sharp vector style with added animation running in the background. Runner uses full 3D models in the environment however in doing this the retro feel is sort of negated as colours and lighting really don’t match up with the theme. The use of 3D in the game is a bonus and does fully embrace on screen text making it pop out, however that’s all it is, a bonus and is never needed during gameplay. Also when using the 3D mode in Runner there is a noticeable drop in the game’s frame rate but nothing that will hinder the overall experience. Runner's retro bonus is a cool addition! For some of the titles sound becomes a very important factor in order to have the gameplay feel more real and immersive. Depending on the mechanics, the sound used has a completely different function e.g. In Runner, every time you jump over a rock or kick down a wall, a sound plays. They take it further here by mixing up the background music every time you pick up a red cross. Its use of sound is simple but effective, while at the same time not disrupting you from the game. It’s interesting how all the BIT.TRIP games are completely different from each other in both its mechanics and gameplay. This is a huge plus as it makes you view each game separately. The fact that you can adjust to one and be completely thrown off by the other gives the package a fresh outlook. While all games should be played, chances are there will only be one or two you’ll be playing regularly. 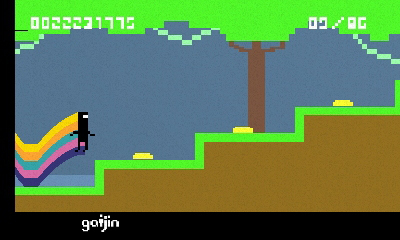 BIT.TRIP SAGA brings six great games together in one with each challenging the player in a slightly different way. The game allows players from all levels to pick it up and play it immediately while still offering enough in its gameplay to challenge those who are serious. It may not be something that keeps up with the current gen however there is no doubt that it is incredibly fun to play.